The Alemannia Music Foundation, Inc. is a non-profit educational organization located in the So. California area. The purpose of the foundation is to provide musical education and appreciation to amateur and professional musicians, as well as to the general public, with a particular emphasis on the classical, folk, and popular music of the German speaking regions of central and eastern Europe. Learn more about our mission and goals . . . Contact us today to have our band play for your next celebration or Oktoberfest! With ensembles of 17 to over 25 musicians we′ll bring a little bit of Europe right to your event! 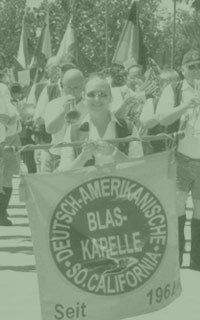 Find out more about the German-American Brass Band. • Congratulations to the Fountain Valley High School String Orchestra on being named the recipient of the 2018 Hans Schmelzer Music Award established by AMF to promote study of mid-European folk, classical, and popular music at So. California schools, colleges and other performance groups. • Musicians invited to join AMF as members of the German-American Brass Band.